The President of the Irish and Fenian Republican Brotherhood, William James (Billy) McGuire will once again lead the Independence Day commemorations and turn the Sovereign seal of the very first Dáil éireann and the Dáil éireann Courts (4 Courts) for and on behalf of the People this year on Monday the 21st January at 12 noon at the Mansion House in Dublin. The 21st January this year (2019) marks the 100th Anniversary of the establishment of the Sovereign Republic of éire and its Revolutionary Irish Republican Government, Dáil éireann, democratically elected by the people of the whole Island of Ireland. After the landslide victory in the general election of 1918 for the IRB's political wing, Sinn Fein and its manifesto, to set up a self-governing body in Dublin, the elected representatives sat for the first time as Dáil éireann at the Mansion House, Dublin on the 21st January 1919 and proceeded to administer the institutes of a working Sovereign government. On the morning of the 21st January, in Vaughan’s Hotel (GHQ of the Irish Republican Brotherhood) on now Parnell Square, Dublin, Billy’s grand-uncle Tom McGuire as head of the IRB elevated and turned the Sovereign Seal of Dáil éireann , from the rising sun to the setting sun, from north to south and from east to west, and from Pagan to Christian to Sovereign; As in the 1916 Proclamation, claiming sovereignty on behalf of the Sovereign people and the Sovereign Republic of éire and all there in and thereof. That same day at 12 noon, on the 21st January 1919, the elected members met for a private session in the dining room of the Mansion house to receive their seals of office. The room thus became known as the cabinet room. The seals depicted the chosen emblem of Ireland, the Harp and the name of the Sovereign Nation, éire. The first public meeting of Sovereign Dáil éireann occurred in the Round Room of the Mansion House; the proceedings were conducted for the only time entirely in the Irish language, except for previously drafted declarations that were repeated in French and English. The Proclamation was read and ratified. The Sovereign Dáil elected Cathal Brugha as its Ceann Comhairle (chairman). A number of documents were then adopted. These were the: Sovereign 1919 Dáil éireann Constitution, Declaration of Independence, Message to the Free Nations of the World and the Democratic Programme. The Declaration of Independence asserted that Dáil éireann was the parliament of a sovereign state called the "Sovereign Republic and Dáil Éireann established a cabinet called the Ministry or "Aireacht and elected a prime minister known both as the "Príomh Aire" and the "President of Dáil Éireann”. The British Parliament and Monarch refused to recognise the democratic elections held twice to establish the ‘First and Second’ Dáil éireann governments and declared Sovereign Dáil éireann an illegal assembly. Having imposed the division of Ireland by its 1920 Ireland act, creating the parliament of Northern Ireland and the Parliament of Southern Ireland, Britain negotiated a quasi-treaty with itself under the threat of immediate and terrible war; potentially meaning the annihilation of the Irish people if the treaty was not accepted. This treaty was in fact with what it referred to duplicity as its Parliament of Southern Ireland. This created a divide within the establishment of the democratically elected Sovereign Dáil éireann. The Irish Free State came into existence in 1922 with the oath to the King, his heirs and successors and with membership to the British Commonwealth. The annexed six counties of Antrim, Armagh, Down, Fermanagh, Derry and Tyrone, an apartheid orange state known as Northern Ireland, split the Sinn Féin coalition and led to the outbreak of the Civil War. This period of history has been extensively studied by distinguished Professor Francis M. Carroll in his book: 'Money For Ireland'. Finance, Diplomacy, Politics and the First Dáil Éireann Loans, 1919-36. On Page 114 Carroll states “The decision in Irish Free State v. Garanty Safe Deposit Company contained a large measure of irony inasmuch as it reinforced the Republican opponents of the Irish Free State. It confirmed their view that the Irish Free State was the "Freak" State rather than the political descendant, legally and democratically arrived at through the process of representative government of the first and second Dáili." The royal Dáil and Seanad Oireachtas that sit in Leinster House Dublin, is not Sovereign Dáil éireann. The hearing Carroll refers to found that the Free State was the construction and de jure Parliament of Westminster. The Freestate provisional government of the 26 counties and the 6 county orange free state were imposed as an apartheid system on the people of Ireland by King George V on the 6th December 1921 under the threat of 'immediate and terrible' war. This structure is still in place today. The name of the state is the Sovereign Republic of éire, founded and funded by the Irish Republican Brotherhood. No other state was founded. Billy McGuire turns the seal at the residence of the lord mayor of Dublin every year. 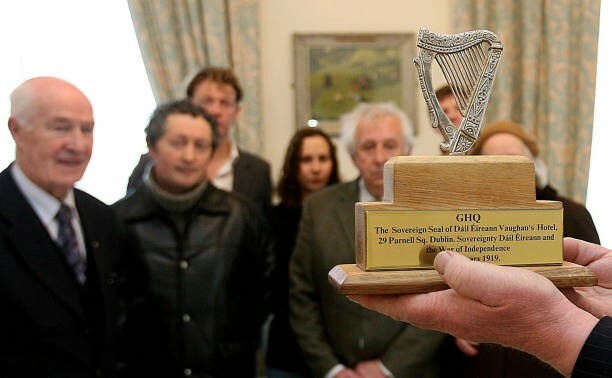 The event includes a presentation from the IRB president on the importance of the turning of the sovereign seal in claiming Ireland's natural resources of oil, gas, minerals, water and fishing rights which belong to the Sovereign People of Ireland exactly and verbatim as proclaimed in accordance with the 1916 Proclamation. In this centenary year of the successful establishment and ratification of the Sovereign Republic of éire, Billy asks the international community and those that value self-determination, integrity and goodwill towards all of their neighbours the following question: if Sovereign Dail éireann was declared an illegal assembly by King George V, and a legal determination was made proving same in another nation's courts ; then who are the individuals currently sitting in Leinster House in 2019 and what is their intent? Moreover, how can their European counterparts be satisfied with such an arrangement? Billy has been president of the Irish Republican Brotherhood for well over 50 years. His family were embedded in the Republican Movement from the early days of the 1900s. Billy’s grand-uncle Tom McGuire bought Vaughan’s Hotel in 1917 (the GHQ of the IRB during Mrs Vaughan’s time), on Parnell Square. The McGuire family donated one million pounds sterling which financed the general election of 1918. Tom had previously been posted overseas in India and sent vital intelligence back to Vaughan’s via Sam Maguire in London. While in India he befriended V.V.Giri, who later came to study law in Dublin. Giri joined the IRB and subsequently witnessed the rise of Republican ideals whilst studying here. V.V. Giri went on to become India’s fourth president after independence, and through his Irish Republican connections, India adopted the same colour flag as éire. An Indian delegation continues to commemorate Ireland’s Independence at the Mansion House. It must also be noted that the Mc Guire family once owned the land and house where the University of Limerick stands. The family donated their home to build a technological institute for the people of Limerick, Tipperary and Clare. In February 2018, the IRB committee, branches and ALL their positions were dissolved. In March 2018, the organisation celebrated its 160th Anniversary at 16 Lombard Street in Dublin, where James Stephens had founded the revolutionary group. The IRB remains a constitutional organisation and still in existence under its lifelong President Billy Mc Guire. More details of the 100th Anniversary Commemoration of the first Dáil éireann will follow on the events section of the ONLY official IRB website billymcguire.com. President of the Irish and Fenian Republican Brotherhood’s, President of the Sovereign Republic of éire, Dáil éireann and the Dáil éireann courts (4courts), Keeper of the Sovereign Seals.